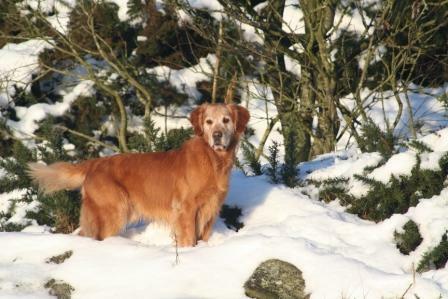 Stirling was our first golden and the one who started it all. He was a very happy fellow and would follow pretty much anyone, anytime who offered him a friendly pat or a kind word. I absolutely loved this dog. He was so much fun and is such a big goofball, he never failed to bring a smile to my face. Stirling was the second dog I showed to a Canadian Championship and he completed his Canadian CD title in three straight trials at the Alberta Kennel Club in February of 2006 proving he was more than just a handsome dude. 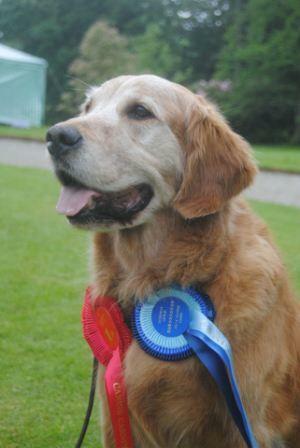 He also loved agility, and earned a couple of CKC agility titles as well. Most of all, Stirling loved to perform with the Spruce Meadows Prairie Dogs, and it was definitely the highlight of his summer. A real crowd pleaser, his motto was – “BRING IT ON, LET’S RACE! !” He was such a good boy, my big galoot! At 10 years of age, Stirling passed his CKC Working Certificate test at the GRCC National Specialty, adding another title to his name and further proving his versatility and talent. He was an awesome fellow and I feel so blessed to have had him in my life. I have learned so much from this dog, and he will forever be in my heart. He is the best boy dog ever!! Stirling made the journey to the Rainbow Bridge on December 14th 2012 at home surrounded by love. His passing was peaceful. We miss him more than words can say. He was an amazing dog who lived life to the fullest and taught us all to live in the moment, never hold grudges, love and be loved. Godspeed my boy…see you on the other side.